For those of you who have been able to attend one of York University’s KM in the AM events, you will know the reward for early mornings are a nice, hot breakfast along with the chance to engage with researchers and community leaders. Research speed dating is one metaphor we have heard used to describe these events, but they are simply a place for people to meet and interact around a common topic of interest. And if the event helps plant the seeds of collaboration around a project, that’s a bonus! After four years of hosting these events throughout York Region, we have had 331 participants and 97% of those who attended found the event useful. We are set to launch a fifth season, and in the spirit of responsiveness and continuous improvement, we’re adopting a slight modification to some of our events this year and our inaugural event reflects this. 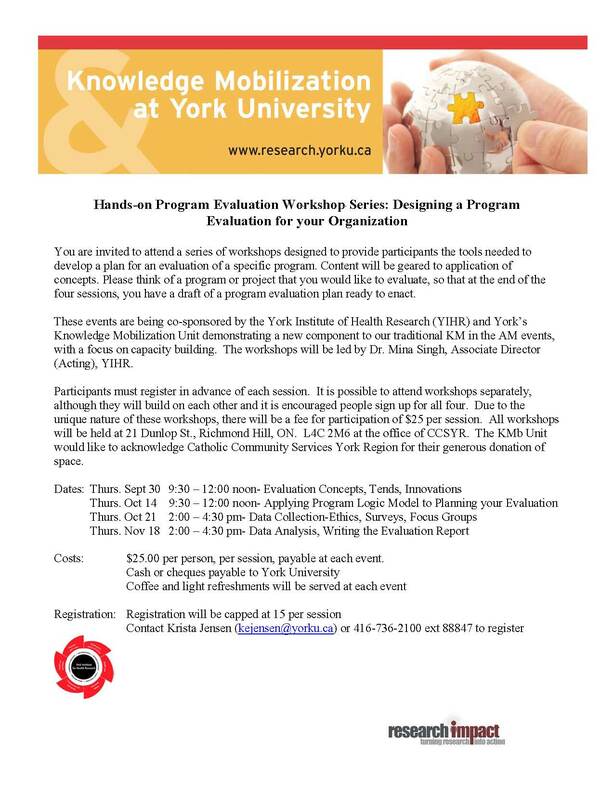 Starting September 30, the York Institute for Health Research, in collabortion with the KMb Unit will be co-hosting a workshop series on Program Evaluation. This will be the first capacity building KM in the AM we’ve offered. Many of our partners have identified their desire to learn the skill sets needed to better participate in knowledge mobilization activities, and this is the first foray for us to meet these needs. Location: All workshops will be held at 21 Dunlop St., Richmond Hill at the Office of Catholic Community Services York Region. The KMb Unit would like to acknowledge CCSYR for their generous donation of space. Costs: $25.00 per person, per session, payable at each event. Cash or cheques payable to York University. Registration will be capped at 15 per session and coffee and light refreshments will be served at each event. To register or inquire about more details, please contact Krista Jensen, KMb Officer at York, at kejensen@yorku.ca or 416-736-2100 ext. 88847. Be sure to check www.researchimpact.ca for additional information on upcoming YorkU KM in the AM events, soon to be scheduled for October and November 2010.